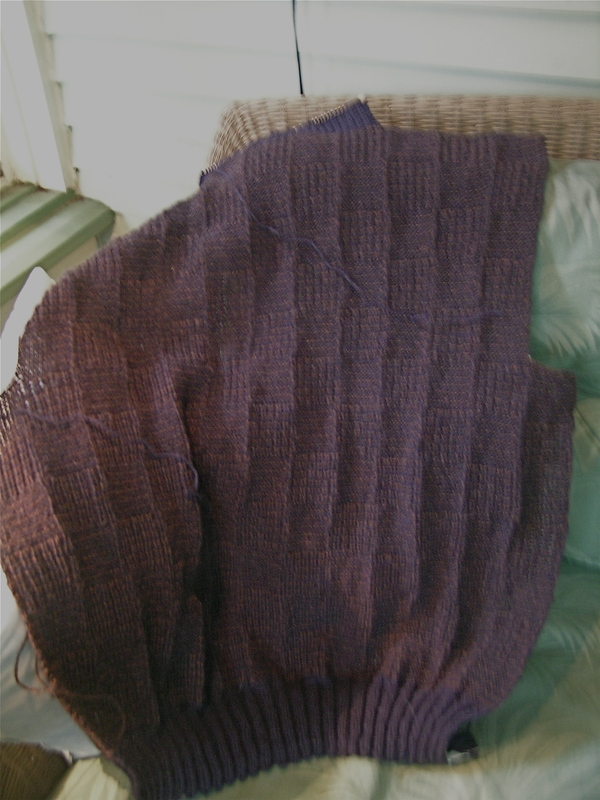 I finished the back of the Chess sweater by Hanne Falkenberg, and am about 1/3 of the way done with the front. As usual with her patterns, they are slow, and lots and lots of knitting. But, that is what I love about them, the gauge of the fabric and the attention to minutia. I am very excited about the Wisconsin Sheep and Wool Festival this weekend. I am taking my first spinning class (with a real spinning wheel, took the drop spindle class last year). I know that the time is right to purchase a spinning wheel, so I need to do some research and see what works best for me after this class. Also, looking forward to seeing the different breeds of sheep and understanding the wool differences, and to seeing the sheep dogs in action. Your post prompted me to look at Hanne Falkenberg’s website – wonderful designs. Your Chess sweater will be great. Lucky man. Aren’t her patterns beautiful. I made a sweater of her’s years ago, and get tons of compliments on it whenever I wear it.